We Strive To Provide Businesses With Individualized, Cost-Effective And Goal-Oriented Retirement Benefits. At Hunnex and Shoemaker, we help our clients attain financial security, while reducing the administrative burden on business owners. A family-business through and through, we always offer reliable service, timely support, and genuine care. Hunnex & Shoemaker has been recognized on a National level for our commitment to high service standards. • Family Business of the Year Award: Small Business Category. Awarded by Pacific Lutheran University and featured in the Puget Sound Business Journal. 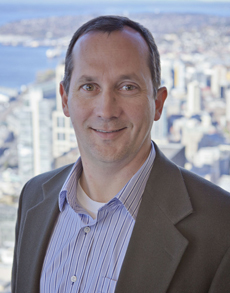 Larry joined Founder James E. Hunnex at the business in 1990, after graduating from the University of Puget Sound. As a CPA (he is proud to say he passed the exam on his first try), he quickly became an integral asset to the business with his “big picture” mentality, and was made partner in 1999. In 2004 the business was renamed Hunnex and Shoemaker. Larry is actively involved in the sales process for new business, as well as ongoing service and administration for existing clientele. His definition of service is promptly doing what you say you are going to do. He is passionate about helping clients achieve their retirement planning goals by never sacrificing the businesses level of service and commitment to them. Outside the office. Larry and his wife Kathleen enjoy showing the world to their kids through travel. This summer of 2018 will see the family heading to Tanzania as Larry and his daughter are going to climb Mount Kilimanjaro and then the family will safari around the Ngorongoro Crater. For Josh, Hunnex and Shoemaker is about so much more than 401(k) Plans—it’s about taking care of families. Josh joined the family business upon graduating from the University of Washington in 2006. In 2012, he received a Qualified 401(k) Administrator (QKA) designation from the American Society of Pension Professionals & Actuaries (ASPPA). He is passionate about serving clients, building relationships within the industry, and networking to expand and improve the Qualified Retirement Plan business. He currently sits on three National Retirement Providers TPA Advisory Councils, where he encourages innovation within the industry and serves as an advocate for third party administrators across the country. Business endeavors aside, Josh is a board member at the Hear See Hope Foundation, which seeks a cure for Usher Syndrome, as well as Invest in Youth, a program that helps raise funding for one-on-one tutoring and enrichment programs in public schools across the Greater Seattle Area. Most importantly, Josh loves spending time with his wife, Kristi, and his sons, Dallas and Callan. A bonafide UW Alum who roots for all Seattle sports teams, Josh has a special place in his heart for Husky Football, sharing season tickets with his brother, Tyler. As part of Hunnex & Shoemaker's core values, we strive to give back to local communities and charities. Below are a few of the local causes we support.